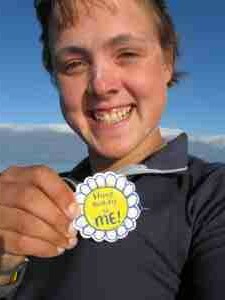 Happy socks and her birthday badge! Very many Happy Birthday belated wishes.. I did actually celebrate your birthday with my dearest friend in Norway. I showed your blog and we tracked your route and had some red wine to toast to you! Great pictures of you – so sunny! It are not here raining also (Perth) Stay sane….and laughing. How do you do that …. I have just commented over on your other site? where ever that was ~ not sure …. “Wouldn’t it be nice to send photo’s etc?” Weird or what!! Photo’s arrived Phew!! We are keeping an eye on your progress here. You are doing really well. I see in your Blog recently that you couldn’t fit the handle to the Katadyn watermaker in the locker. You are meant to unbolt the ‘watermaker’ part from the motor and reconnect the handle and use outside the locker the same as you would with the 35 Survivor. I agree that you would have been better to have got the 35 Survivor out when your power was too low for the 12V motor on the 40E. There is also the risk of losing one of the nuts or pins overboard when disconnecting. Jim MacDonald and staff at Mactra. Well, losing the cooking pot over the side was obviously telling you something and The Tweedles must have been secretly, very pleased. Rumour has it, they’re using it to play hide and seek. I’ve just started following your progress after listening to you the other night on the Stuart Maconie show on Radio 2, whilst driving to work. There was me thinking ‘not another night shift – please make it go quickly’, and there were you bright as a button. My wrists were metaphorically slapped and everything was fine! Good luck and I look forward to seeing more. keep up the good spirits ,you are going great ,birthday out the way now on with the work ,the weather will be your way soon and you will kill those naughty,s enjoy your rest in little hutchy as plenty of work to come take care ,wait for tomorrows blog . We live in COWES sea all around, perfect weather but no sight of any rower, so keep going girl and we will give you a welcome if you blow off course. It is great that you are making good progress and not losing too many things off the boat. Your photos made me wonder whether ocean rowing could ever have got started as a sport without modern communications. Would you have ever considered this voyage without any phone or computer communications ? What absolute happiness you radiate in your pictures Sarah! At the young tender age of 24 and 58 days and 16 hours at sea with just some stripey ship mates and the occassional Albatross is obviously an elixir for life! Where do we sign up for the book? Happy rowing! Lovely pics.Make me feel like I’m almost there, but not as much as your helpful cabin description yesterday. I’m lying under a table now, just as you described, minus the food crumbs.It’s roomy in here, much bigger than my tent! Of course my tent is pretty dry inside, and stays still when not being pushed about by bears (as it was four days ago).As for those photos,where are those menacing waves of the Indian Ocean I’ve been imagining? Looks like a peaceful millpond out there. 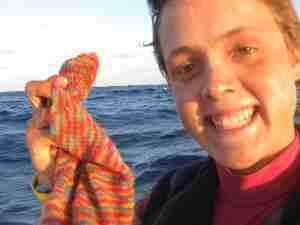 Good to see such a warm smile on your face after so many days at sea. Here in the colonies there is a morning radio show called “The Bob and Tom Show” I sent them a note about you. A mention, or a phone interview on their show would be a good way to get the word out to us Yanks. Lovely sunlit pics. It must all be fun out there. I’m keeping some champagne for you. Hi Sarah, great happy snaps!! keep up the good work. may you have tail winds for the rest of the trip!! Hi Sarah, you look as happy as ever. Happy socks are just as you described them. My husband’s pair are just the same only with a green colour conbination. Amazing aren’t they! First time I saw them I wondered how my mother had managed to knit such an inticate pattern into the socks until I saw the wool. Enjoy the good weather and get some nauties under the keel. Well done, Sarah. You’ve averaged about 1.5 nmph over the last 75 hours, and in the right direction. I sincerely hope that all goes well for you for the remainder of the journey. Great photos, such a lovely smile. Good one! Well done Sarah we are thinking of you the whole time. You are looking great. Eric and George send thier love and have asked if you would like a hand over the last few weeks?